The MC5 appeared at Wayne State University for an afternoon concert on July 19, 1970. A black and white film captured the quintet’s rebellious musical talents, but Dakota from Weird Womb and I have always wondered about a tall bearded man standing against the speakers. He was wearing a white hat and tee-shirt. “Maybe he was a roadie,” offered Dakota. The mystery continues to this day. 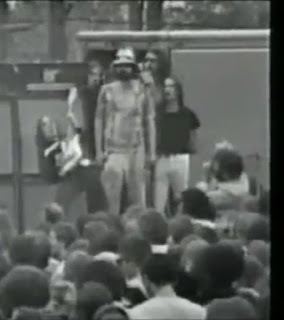 This entry was written by Peter, posted on January 23, 2017 at 12:31 pm, filed under 70s, revolution, rock and tagged 1970, looking at you, man in white hat, mc5, wayne state concert. Bookmark the permalink. Follow any comments here with the RSS feed for this post. Post a comment or leave a trackback: Trackback URL.